FRKO RICO is the Atlanta man behind this cartoon masterpiece. On Thursday night, Gucci Mane dropped "All My Children," a bouncing, excellent tribute to his progeny, which declares his pride in them. The artwork for the song is equally as good — it shows a cartoon Gucci, who sits in a chair while a crew of rugrats pile on top. 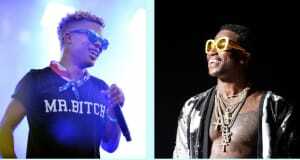 FRKO was given four hours to complete his art for the single, and told not to depict anyone in particular (except for Gucci) on the cover. Any onlookers hoping to figure out which rap-based babies art are stand-ins for their favorite artists will be disappointed. As Rico said, "They're random kids. I wasn't trying to catch people's lives in this. They said don't put people's names on it. I kept it real broad." FRKO called experience a surprise, and a huge milestone. "I'm from Atlanta," he said. "I grew up on Atlanta rap. Gucci came up when I was in middle school. He really is pops, he's the godfather of trap. He influenced the hell out of me. He's so original and he inspired us to do the same. A lot of people aren't as original as him, but they're trying." The "All My Children" cover is not the first time FRKO has drawn Gucci. One of the artist's most well known works shows the rapper in a Shawshank Redemption-like scene, breaking out of jail. On Gucci's release day, FRKO drew an imagined portrait of his release. Below, see those, and some more of FRKO's best Gucci portraiture.